COMPANY PROFILE MEG Energy Corp is an oil exploration company. It is engaged in the development of oil sands in Alberta. It has two commercial SAGD projects; the Christina Lake Project and the Surmont Project. MEG Energy is engaged in in situ oil sands development and production in Alberta, Canada. As of Jan. 30, 2016, the company reported estimated net proved and probable reserves of 2.9 billion barrels of oil equivalent. Net production averaged 81,000 barrels per day in 2016. 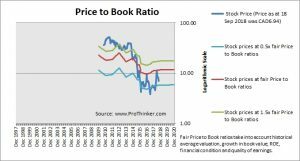 At the price of CAD6.94 as at 18 Sep 2018, Meg Energy Corp is trading at a Price to Book Ratio of 0.5 times current book value. 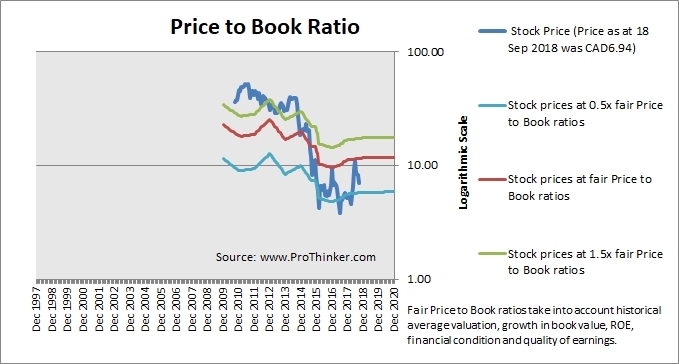 This is a 40.0% discount to current fair Price to Book Ratio of 0.9 times.